S. Bornholdt and K. Klemm (eds. 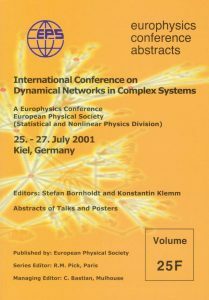 ), Dynamical Networks in Complex Systems, Europhysics Conference Abstracts Vol. 25F (2001). Note: We have a few copies of this abstract book left over. For a free copy please send an email to @ . . . 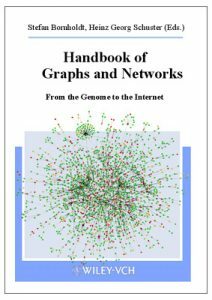 The corresponding conference site can be found here: International Conference on Dynamical Networks in Complex Systems 2001. 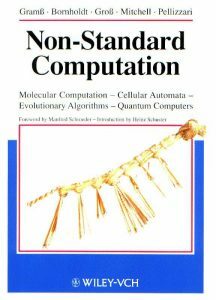 T. Gramss, S. Bornholdt, M. Gross, M. Mitchell, and T. Pellizari, Non-Standard Computation, VCH Verlag, Weinheim (1998). S. Bornholdt und P.H. Feindt (eds. ), Komplexe adaptive Systeme, Verlag Josef Roell, Dettelbach (1996).